That's a gorgeous dress you got there dear! Love the pastel color, and the bell sleeve is such a fabulous touch! You're definitely rocking it dear! Perfect styling, my friend! I love this dress and it really translates well into a colder weather piece when layered properly. You look gorgeous as always! Have a fabulous weekend. Great look! Have a good weekend! This dress is so pretty and I absolutely love how you styled it! What a great versatile piece! I love the way you styled this spring dress! 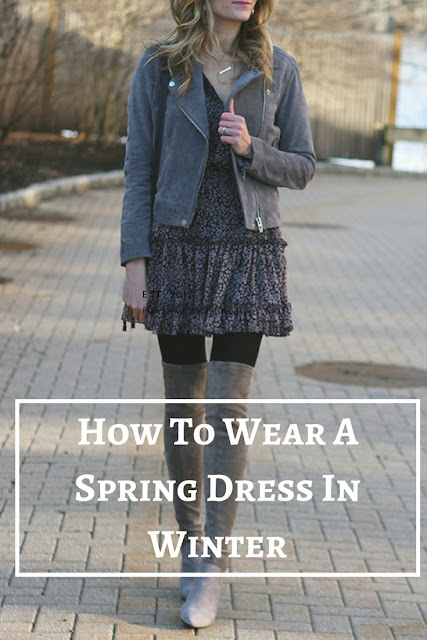 I've done this and love that I can use some of my favorite dresses in different seasons! What a great idea to wear tights under that dress with the OTK boots. I've never seen that before. I love it. I really do love the extra warmth that OTK boots give and I also love the color of your OTK boots! This dress is so cute styled for the winter! 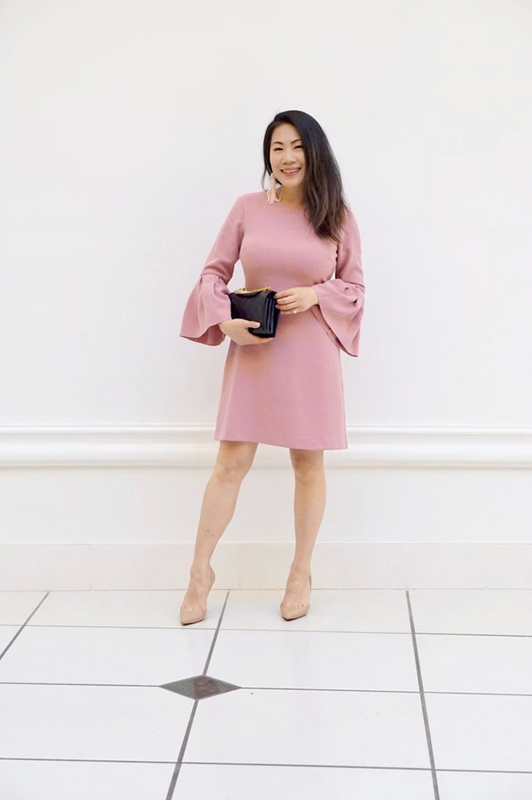 I need to try layering a turtleneck or long sleeve blouse under some of my sleeveless dresses. Such a perfectly styled outfit!!! So edgy and cute. This look is perfect! I love how you paired the boots with the dress. I love putting tights or leggings for short dress and this look is perfect for spring. I'm impatient like you, so I'm always trying to find ways to wear something new, now! This is a great combination, I agree with you, your jacket looks perfect next to the colors of the dress! Such a cute floral dress! It looks great with your moto jacket and OTK boots. Really pretty dress! I love how you've styled it for colder weater with the OTK boots. Such a cute dress! I need to grab a new fix soon! Loving how you paired it with these boots too! Love these ideas! The grey suede looks really good with your black tights and the colours in your dress! you rock those boots! great look! I love how you styled your spring dress. I am also impatient & love my more girlie clothing. Great style advice!! Have a great week! !